(From Sigma lens literature) This circular fisheye lens is used to produce circular images with an angle of view of 180 degrees when attached to a full-frame digital or 35mm film SLR camera. This auto focus lens is equipped with a new multi-layer coating technology that reduces both flare and ghosting. This lens can be used for the scientific applications. The new multi layer lens coating and lens design reduce flare and ghost, which is a common problem with digital cameras, and also creates an optimum color balance. This large aperture standard zoom lens provides superior performance both for Digital SLR Cameras and 35mm Film SLR Cameras. This unique lens is used to produce circular images with an angle of view of 180 degrees and also incorporates auto focus system to get accurate focusing that might be difficult through finder due to extremely large depth of field. This lens can be used for the scientific applications such as the solid angle measurements of cloud distribution over the sky, the vegetation distribution of the forest, etc., due to the quantifiable angle/area relationship it produces. Also supplied with the lens is a fitted padded case and a gelatin filter holder at the rear, allowing the use of gelatin filters. 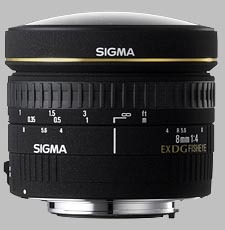 The Sigma 8mm f/4 EX DG Circular Fisheye doesn't have any user reviews yet!